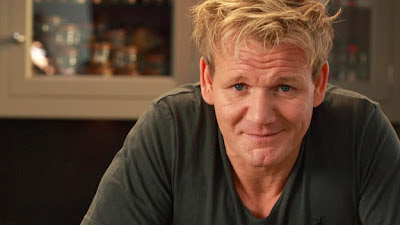 Gordon Ramsay has made a home for himself in Channel 4's peak schedule, and this autumn he joins the Daytime line-up with a brand new series that will teach viewers how to cook amazing food standing on their heads. Throw away those complicated cook books and never-used kitchen gadgets - Gordon Ramsay's Ultimate Cookery Course is all about giving home cooks the confidence and inspiration to hit the stoves and get cooking. Whether you love cooking already, or you're starting from scratch, Gordon will get you making modern recipes that are simple and accessible with a wow factor and an edge. Each episode will concentrate on a different theme essential for the modern cook - from the secret of cooking with chilli and spice, through to baking, roasting and slow cooking - and will be packed full of useful tricks and tips to save time and money. Gordon takes culinary inspiration from around the globe to show us simple, vibrant and utterly delicious recipes that reflect the way we all eat today. From deliciously sticky, beef short ribs, slow braised stuffed lamb breast and simple spiced chicken wraps, to noodle dishes to die for and super easy salads, there will be something for everyone. Quick, tasty and packed full of delicious recipes to tickle everyone's taste buds - Gordon Ramsay's Ultimate Cookery Course is the only cookery course you'll ever need. Gordon said: "Over the past 25 years I have been lucky enough to work with some of the best chefs in the world, from the amazing Roux brothers to Guy Savoy and Joel Robuchon. I have travelled, opened restaurants from London to LA to the Middle East and earned a number of Michelin Stars. I now want to get back to basics - strip away all the complexity, all the hard graft and show you how to cook amazing food with ease at home. I want to give the home cook the confidence and inspiration to hit the stoves and get cooking. Whether you love cooking already or you're starting from scratch, this programme is all about simple, accessible modern recipes that still have an edge and will impress. The more you cook, the more confident you will become, and the more time you will want to spend in the kitchen. Good luck and most of all, enjoy it!" What will Gordon Ramsay's Ultimate Cookery Course teach the home cook? The Ultimate Cookery Course strips away all the complexity, all the hard graft and teaches you how to cook amazing food with ease. Why have you filmed this series now? This is something that I have wanted to do for a while. I want to help teach people to enjoy cooking at home. It feels like the right time to simplify and put the knowledge that I have learnt in to one place, and the Ultimate Cookery Course book and series will act as a sort of bible for home cooks. It's just about good, hearty, home cooked food. Over the last 25 years I have worked with some of the best chefs in the world and spent years perfecting my craft, but bringing it back to basics reminds me of where I started. Where or how can home cooks go wrong? Over complicating things. If you keep it simple and use good quality ingredients you can create incredible home cooked meals. What qualities does the home chef need to have to be a good cook? A love and respect for fresh produce. Ultimately just have fun in the kitchen and don't take it too seriously. What do you want people to get from this series? I want to show that cooking can be fun and exciting. It's all about encouraging people to take a fresh look at familiar ingredients and throw in some new ones and create a delicious meal. I want people to have confidence in the kitchen. If a home cook is going to invest in two or three good pieces of cooking equipment, what would you recommend? Essentially kitchen equipment starts and pretty much finishes with a good set of knives and pans. Armed with these, there are not a lot of jobs that you can't tackle. Other pieces of simple, but valuable kitchen equipment are a whisk, vegetable peeler, sieve, scales, food processor, blender and pestle & mortar. What are some of your favourite culinary destinations? So hard to choose because I have been lucky enough to travel to lots of places with my work and eat some truly incredible food. I spent quite a lot of time traveling through India and South East Asia eating traditional home cooked dishes, street food and restaurant meals. It really opened my eyes to interesting flavour, herb and spice combinations. The Gordon Ramsay empire is ever growing - how do you stay in touch with it? My team. I am lucky to have a team across all areas of my business that I trust and believe in. I work with the head chefs of each restaurant on perfecting the menus and with the wait staff to ensure that the customer service is impeccable. The customer is king after all! I am blessed to be in this position and to have people around me to keep things moving forward. What's your comfort food that you cook after a hard day for yourself and the family? When I have a night off I like to cook dishes that are really simple but tasty. Either a nice quick pasta dish, maybe a napoletana, or a juicy steak with a simple salad on the side. Which fellow chef do you most admire and why? I was lucky enough to work in some of the best kitchens in the world and they've all done their bit to shape me in some way. Specifically Guy Savoy and Joel Robuchon both taught me about precision and the importance of treating good-quality ingredients with respect. Alain Ducasse has always been an inspiration. No other chef has been able to hold on to three three-star restaurants in different countries and be able to successfully expand his empire simultaneously. Why are TV cooking shows so popular? People like to eat good food. With the accessibility to quality and seasonal produce and professional equipment, the home chef is on the rise. People are becoming more experiential and trying new things. Cooking shows offer advice and tips while also showing that you can create a great meal at home. What key ingredients should we always have in our store cupboard? I always have the core basics in the larder: good quality olive oil, groundnut oil, Maldon sea salt, and every kind of spice you can think of, especially fresh vanilla pods. I also keep a good selection of dried and canned beans in the larder. They're nutritious and are fantastic added to soups and stews. And I don't remember a time when we didn't have pots of fresh herbs on the windowsill or in the garden. They are great for adding freshness to any dish. I want this series to give you confidence and inspiration to hit the stoves and get cooking; whether you love cooking already or you're starting from scratch. Being in the kitchen is like therapy for me. If I have had a long day, I will often pop in to see Clare Smyth at Royal Hospital Road and work with her and the team. You've chosen Clare Smyth for head chef in Restaurant Gordon Ramsay. Do you think the Kitchen is a tough place for female chefs? Women bring a far greater level of patience and tolerance to a kitchen than any male chef I've ever met. I think that being in a kitchen is tough for anyone, man or woman. Clare has worked exceptionally hard and has opened the gates for female chefs. She has helped to create a level playing field. I am a bit of a workaholic! I also believe in not giving up, even when things go wrong. Keep moving forward and learning along the way. What's the worst thing you have ever eaten? And the best? It's hard to say as I have had the opportunity to taste so many different foods - good and bad! My travels to South East Asia and India were very interesting food-wise, but I wouldn't rush back to some of the things I encountered like the spiders! Everyone knows that I am a fan of British classics, and I love a good Beef Wellington.